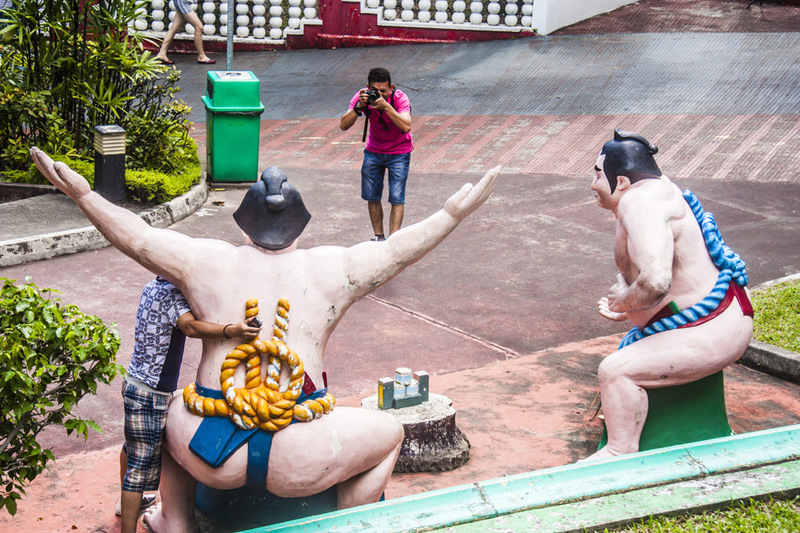 Some liberties were taken with Sumo San. Luckily both sumos were in a cooperative mood. I had a picture of the sumos from the front, a few weeks ago. Hahaha I bet his picture ended up on facebook! Eh eh great timing here Ayush! haha they look a little ttoooooo cooperative to me fun shot, love the colour! Great shot Ayush! You captured a modern moment with these ancient athletes! HA! Harmless as a dove and waiting for the photo op! Hahha.. I bet these weren't the first to do that The girls, too, would love it, I'm sure. Well seen. I used to watch Sumo wrestling on TV, sometimes these giants end up in between the audience, can you imagine such a sweetie on your lap?? Great shot, Bill might be right. Almost like the real thing Ayush. OMG I still remember the slope! Do they still have the tiger and leopard at the entrance? Looks like the number of hugs he gets is wearing him way!!! I like this interaction, Ayush.